The Led Pressure Alarm Tyre Pressure Monitor (TPMS) valve cap is a must for people that want to make sure that their tires are properly inflated. Once installed the Led Pressure Alarm Cap TPMS valve cap will alert you if the tyre pressure drops by a setpoint pressure. The Light Vehicle version of the Smart Cap Tire Pressure Monitor system is availabe for automobiles, SUVs, light trucks, vans, motorcycles, scooters, trailers, ATVs, etc. with a pressure range of 10 to 70 psi and a low pressure warning trigger of 4 psi (with a +/- 10% accuracy). The Heavy Duty professional grade Led Pressure Alarm TPMS for fleets and commercial applications is available with a 4 or 8 psi low pressure flashing Led light alarm trigger, and is suitable for pressure ranges from 30 to 170 psi. The bright red blinking led light will continue to warn you of low tire pressure for more than a month. Easy to Install – Simply screw valve caps onto tire valve stems. Automatically compensates for ambient temperature changes to avoid false alarms. Comes with integrated anti-theft device. Long lasting low pressure alert – blinking red light alerts of low pressure for 500 hours (more than a month). Low battery alarm – the led valve cap will blink yellow for up to 100 hours to alert you that the batteries are running low. Long Lasting 3 year battery shelf life. Great compliment to Led Pressure Alarm TPS filled tyres – 100% compatible and now you can be alerted of a slow leak. Proper tyre inflation pressure helps extend tyre life. 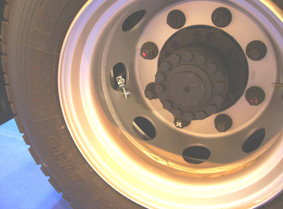 Proper tyre inflation pressure helps optimize fuel economy and save up to 3% in fuel. Available in 2 and 4 pack blister Packaging, as well individual and bulk packaging.